The two bears appear in a series of children's books by Mark Billen. During 2018 Henry, Fred and their friends have raised over £700 for Action for Children. Sales of the bears' books have raised over £4700. Henry and Fred's famous railway story is available again! Fred is delighted as he loved driving the red locomotive! Open the PDF for some sample pages of this story! Henry worked hard to open the box and take out the books. Afterwards he sat down with his friends and showed them the story. Here is a story; a free download so that you can read about their adventure! 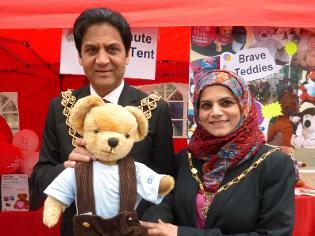 Here is Fred with the Lord Mayor of Birmingham and the Lady Mayoress. Fred was presented with a special certificate because he was such a brave bear! The twins, Martin and Miriam, have a new friend, a Corgi dog called Charlie. They all feature in our latest book. We all have some fun with him! Mark Billen is also the author of plays for schools and youth drama groups. The two bears are getting ready to go camping! These two lovable bears are featured in a series of books for young readers. The books are intended to encourage reading.